Don’t Throw Those Pots Away! The pre-winter cleanup continues. I got a jump on tidying things up in the garden when the weather forecast began calling for below zero temps, but there are still things to organize as the threat of a snowstorm looms nearer. It’s now time to clean up lingering potted plants that were happy with the cooler fall weather. Some were gifted to me, others I left on the porch because I knew they’d survive the lower temperatures. A non-frugal gardener might just toss those dead plants in the compost and recycle the pots. But if you’re frugal minded, you’ll see tons of potential for those containers. I keep those pots around for a few reasons, even if they’re a little dirty or the wrong size for my current needs. For planting next year. I use them as containers for herbs or for plants when I’ve run out of room in my main garden beds. For seed starting. If I have lots of small pots laying around, even the flimsy kind, I don’t toss them. I hoard them, actually. Starting plants indoors requires multiple stages of transplanting, and I like to have a variety of pot sizes on hand to ensure none of my seedlings become root bound. For transporting supplies. 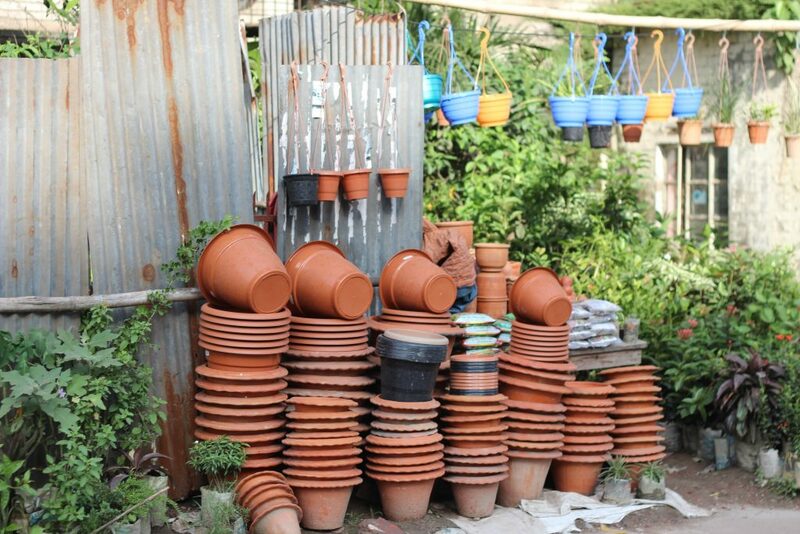 I always like to have a few medium sized pots on hand – preferably sturdy ones – to lug around dirt or other gardening supplies. Without the budget for fancy buckets and pails, I rely on cheap repurposed containers. For indoor potting. Have multiple containers on hand is useful for when you bring home indoor houseplants that might be stuck in too-tiny pots. You also never know when any current pots are going to fail you. Even good-quality sturdy pots crack, break, or get knocked over by sneaky squirrels. In a pinch, an old recycle plant pot will house your homeless plants should such a situation arise. Before re-using containers, be sure to wash them to prevent spreading disease or pests. Think they look clean? Don’t risk it. It’s no fun to lose all your seedlings at once. There are two ways you can sanitize pots so you can use them for other purposes. Dishwasher – This is my preferred method because it’s efficient and I’m sometimes lazy. The heat alone will help kill pathogens and bacteria, but you can pop in some dishwasher detergent for extra cleaning power. Use the top rack for delicate pots. I use this method to clean my seedling trays each year, too. Bleach Bathtub – Add a tiny bit of bleach (a capful should do the trick) to a tub full of hot water and let your pots soak for a little while. Scrub them off if need be. Dry them and return them to your potting station. There’s no reason to trash perfectly good pots. Whether they’re made of plastic, ceramic, or stone, it’s always useful to have extra containers on hand. Save cash and keep your gardening eco-friendly by saving containers from the trash bin.